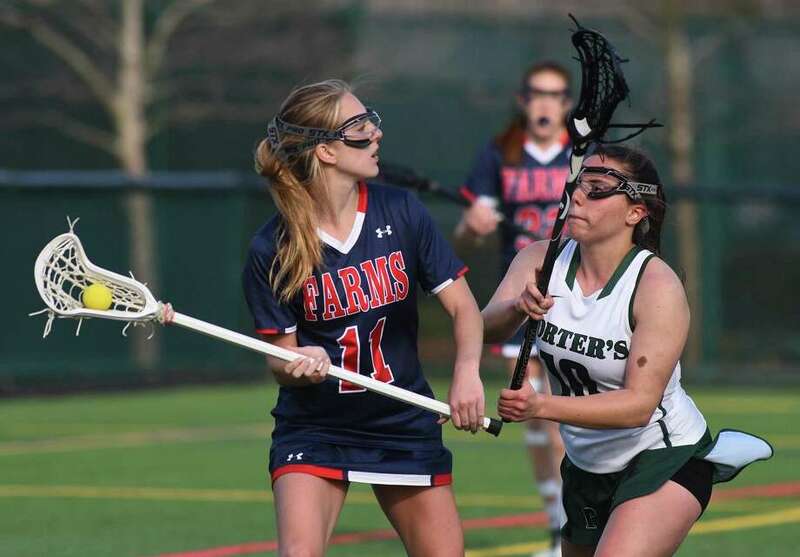 GFA girls lacrosse player Bella Litt of Darien scored eight goals in the Dragons' win over Kingswood-Oxford last week. It was an up-and-down week for the Greens Farms Academy athletic program as the Dragons mixed in some big wins with some tough losses and, of course, plenty of rain drops. Boys tennis was the big winner, going undefeated on the week while our baseball team notched its first win of the season. After a season full of rainouts, the boys tennis team recorded its first win of the season with a decisive 6-1 non-conference win over St Luke’s on Wednesday. The match started with Connor McDonald (Westport) and Sean Minson (Darien) won at No. 1 doubles followed by Aiden Helfant (Westport) and Jack Ramsay (Darien) winning at No. 3 doubles. The team then went on to play singles, winning five of the six matches led by McDonald at 1 singles followed by Marcus Ng (Greenwich) at 4, Ramsey at 4, Helfant at 5 and senior captain Minson at 6. Over the weekend, the Dragons went to St. Luke’s and played their official FAA match, topping the Storm by a 5-2 score. The Dragons got out quick in singles with McDonald and Ng winning in straight sets at No. 1 and 3. At second doubles, Owen Minson (Darien) and Will Schadt (Norwalk) followed with a win, putting GFA up 3-0, but then the match got tighter. St Luke’s then countered with two wins at two singles and one doubles putting the score at 3-2. The Dragons then received two clutch win by No. 4 singles Ramsay and the third doubles team of Jason Garrelick (Wilton) and Jordan Liu (Stamford) to close the match, helping the team secure a victory. The Dragons notched their first league win of the season, taking a 5-2 decision over St. Luke’s on a cold and windy Tuesday afternoon. Freshman pitcher Mark Roszkowski (Westport) gave up just two hits and two runs, firing a complete-game win. He struck out seven. Matt Hochberg (Fairfield) was 1-for-3 with an RBI. The Dragons went on the road to Greenwich to face FAA power Brunswick and were two-hit by the Bruins pitching, falling 8-0. Noah Bachner (Weston) and Noah Kanfer (Westport) had the hits with a single and double respectively. The Dragons fell behind and clawed their way back into the game before falling 9-7 to Avon Old Farms at home on Wednesday afternoon. Liam Murphy (Westport) netted four goals for the Dragons while Charlie Benson (Darien) added three more. Goalie Ryan Pilkington (Weston) made eight saves. On Saturday, Murphy scored four goals and Zach Liston (Wilton) added three more as the Dragons fell to Hamden Hall on the road by a 19-11 score. Benson added two goals while Jack Grills (Darien) and Connor Zaminski (Greenwich) added single tallies. Brady Reynolds (Wilton) notched the team’s only assist. Pilkington made three saves. The Dragons went on the road to Kingswood-Oxford and eked out a 14-13 win, snapping a two-game losing streak. Bella Litt (Darien) scored eight goals, grabbed four ground balls and had three draw controls to pace the GFA offense. Ella Murphy (Darien) and Steph Wistreich (Wilton) both had two goals while Alex Nesi (Fairfield) and Sarah Logan (Darien) notched single tallies. Murphy added five draw controls to the winning effort along with four ground balls. Assists were awarded to Wistreich and Annie Lew (Greenwich). Kelly van Hoesen (Greenwich) made 17 saves. Earlier in the week, van Hoesen made 21 saves, but it still wasn’t enough as Cheshire was able to pull out a 13-10 win over Greens Farms Academy on Wednesday. Wistreich had four goals and two assists while Nesi scored three times. Litt had two goals while Paige Benson (Darien) had one goal and one assist and Sarah Peltier (Stamford) set up one goal. The Dragons played tough, but suffered their second straight road defeat on Thursday, falling 16-12 to Holy Child. Murphy had five goals to lead GFA while Litt added four goals. Peltier, Logan and Wistreich added single goals. Van Hoesen made 13 saves. Five first inning errors led a deluge of King runs, but the Dragons shut out the Vikings the rest of the way in falling on the road in Stamford, 15-0. Jessica Cramer (Wilton) and Piper Dove (Norwalk) both had solid offensive opportunities to reach base for the Dragons, who faced one of the FAA’s top pitchers for the second game in a row. The Dragons, led by Lydia Groves (Stamford), Lucy Nelson (Westport) and Janise Park (Bridgeport), made some spectacular defensive plays, but also fell victim to seven costly errors as Choate ran away with an 11-1 game that was closer than the score indicated. Leah Attai (Bridgeport) had a single for the GFA offense. The Dragons lost on the road, battling tough in a handful of matches. Devon Wolfe (Darien) won five games and Jocelyn Magrone (Darien) won four games each during two single battles while Avery York (Norwalk) and Jesse Boolbol (Greenwich) took five games off their opponent. At third singles, Ava Ewing (Darien) and Margot Goldsmith (Darien) split sets at 6-2, 5-7 and were up 5-1 in the tiebreaker before falling in the end. The Dragons improved their record to 2-2 with a 6-1 win over Hamden Hall on Saturday. All GFA doubles teams played very well, losing only two games across four matches. The No. 1 duo of Dasha Timasheva (Greenwich) and Harriett Wells (Westport) improved their season record to 3-1 with their shutout. Match of the day was at No. 3 singles: A physical and mental battle that lasted nearly three hours was won by Boolbol in 6-4, 7-6 (7-4) fashion. Wolfe (6-2, 6-4) and York (6-4, 6-1) both won as did Michelle Fedotova (Greenwich) and Magrone 6-1, 6-1 at second doubles and Ewing and Allison Telesz (Fairfield) 6-0, 6-0 at third doubles. The Greens Farms Academy Dragons track and field squad competed against three very strong teams at Cheshire Academy, including host CA, Williston, and Millbrook. Senior and newcomer Matt Jackmauh (Old Greenwich) ran 23.93 in the 200m dash which will qualify him to run the 200 in New England Championship in Bath, Maine on May 19. Other athlete’s that put up qualifying marks were freshman Tim Northrop (Fairfield) in high jump (5’8), and long jump (17-9); Ethan Phan (Bridgeport) in the long jump (19-0), Julia Edwards (Westport) in the 100m dash (14.09), Krya Inston (Norwalk) shot put, 25’1; Kristiana Modzelewski (Westport) 100 hurdles (19.19) and 300 hurdles (51.85) and freshman Sam Freeman (Shelton) 100 hurdles 20.82. The team competed in the “Froshmore” Invitational held at Jonathan Law High School in Milford on Saturday. Freeman had a big day. Her personal best time of 19.65 in the 100m hurdles landed her in the final, where she took fifth in 20.09. She also ran the 300 hurdles and ran it in 57.36, a mark that will qualify her to run in New Englands. Laila Pina (Weston) qualified for the meet by collecting a 1:10.22 in the 400m dash. Caroline McCall (Westport) ran a 2:45.33 in her 1st 800m run also earned her a spot in the New England race. Other freshman girls that competed, Aniyah Brunson (Stamford) in the 100 (15.59) and 200 (32.31) and Annabel Lawton (Trumbull) ran a 3:18 in the 800m. Northrop continued to jump well. His 16-4 ½ in the long jump landed him 5th overall, while his 5-4 in the high jump grabbed second. Other freshman boys that competed were Jackson Rassias (Fairfield) who ran a 2:51 in the 800m and Larson Palmgren (Fairfield) who ran a 5:35 in the 1600. The under-manned GFA Ultimate Frisbee team placed fourth out of seven teams at the GFA Invitational on Saturday. The GFA sailing team placed ninth out of 15 teams at the O’Day Qualifier in Greenwich on Saturday.